Sakai Guides and DocumentationSakai Complete User Guide LessonsHow do I delete items on a Lessons page? Instructors can delete items added to a Lessons page using the Delete icon, the Edit option, or the Reorder option. 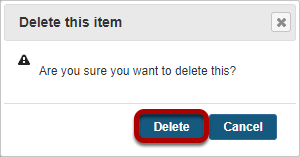 Click on the trashcan (Delete) icon for the item you want to delete. This returns the display to the Lessons page with the item deleted. This displays the reorder list of items added to the Lessons page. Click the red X icon located to the right of the item. Zoom: Click the red X icon located to the right of the item. This removes the item from the Lessons page list of items. Note: You may also drag items over to the right to delete them. Saving returns the display to the Lessons page with the item removed. Prev: How do I reorder items on a Lessons page? Next: How do I limit access to Lessons page items to groups?